SERVPRO of Macon takes great pride in being a part of the Macon community. We understand that communities like ours hold America together. We want to do our part to ensure the Macon community thrives by helping those less fortunate, keeping the area safe and making our community the best it can be. Our SERVPRO of Macon franchise is a family owned and operated company. We feel like our business is a part of our family as well. To show our appreciation for our employees, we have a monthly breakfast to celebrate any staff member's birthday that falls within that month. The front line managers pick an employee of the month each month during the year. The employee receives there name on a company plaque and a gift card. In past years, we have partnered up with various local businesses to support charities right here in Macon, Georgia. 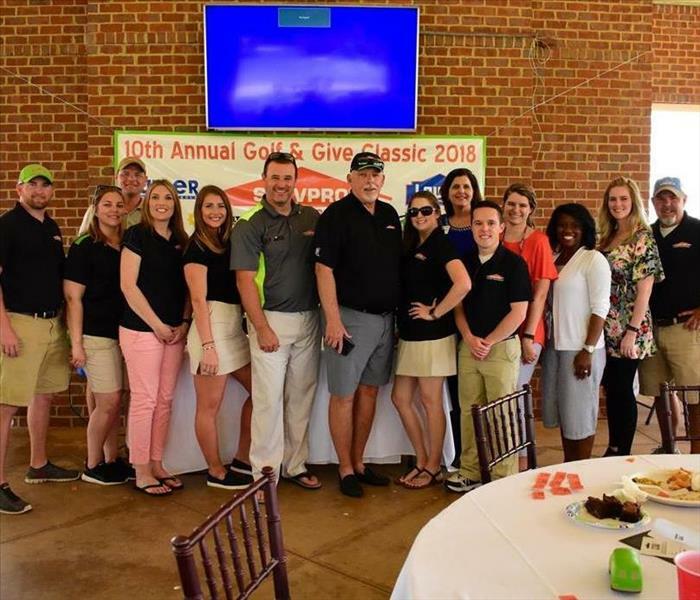 For the past nine years, SERVPRO of Macon has hosted an annual golf tournament benefiting a local charity. 100% of the proceeds raised at our event goes directly to an organization. In 2016-2017, our benefiting charity for our golf tournament was The Children's Methodist Home, we were able to donate $5,000.00 in 2016 and $8,000 in 2017. In April of 2017 SERVPRO of Macon sponsored Macon-Bibb Earth day. We also participated in the annual touch a truck for children.